In the previous posts, we went over the hardware requirements and selection, software and finally mobile software. It is now time to address the sources of digital documents, the true inputs of the digital workflow. Not so long ago, there was a single inbox for all incoming “stuff” that requires your attention. Stuff is here define as anything that needs for you to decide what to do with it, including throwing in the garbage. In the analog world, that single inbox was the good old paper tray: correspondence, various documents, business cards, memos, telephone notes… everything ended-up there for further processing. Nowadays, most of us have multiple mail accounts, each with an inbox(!). We get scientific manuscripts not by going to the library and making photocopies but rather downloading PDF documents from various services like arXiv, ScienceDirect and others. We received invitation to shared or get documents through cloud storage services (DropBox, Google, …). URL, RSS, blogs, etc… name your sources. Of course, we still get some old good paper documents. Let’s face it, it can be a mess. You thought emptying that single physical inbox tray an impossible task, welcome to the digital era! Let’s examine the various sources of documents in your digital life. 1. Paper documents. Yes it is still alive. I keep two physical inboxes, one at work and one at home. I will throw in it all paper documents, bills (at home), written notes (from phone call and others) and so on I received. I will usually empty it once a week. 99% of these documents will end up in the recycle bin after being scanned using my Fujitsu ScanSnap (scanned, OCR’ed and put automatically in DevonThink Pro Office inbox). If you have not gone digital yet, this is were you are going to spend a lot of time at first, scanning those paper documents. TIPs: If a document can be obtained in digital format, ask for it or download it instead of scanning from paper. At first you will need to remind your colleagues to e-mail them to you but after a while it becomes a given for everyone involved. Scan only your ongoing projects documents to start. This will leaving you the time to decide if you really need to scan your reference / archived paper documents. 2. On the fly information. This comes in mainly from a discussion in a corridor or one of these illumination moments. It is something you must remember and possibly take action. Two choices here. Write it down on paper and put it in your physical inbox or capture it digitally. I use either a task manager for this, namely Cultured Code Things (Mac/iOS only) or DevonThink To Go (DTTG). If you must work multi-platform, I suggest giving Wunderkit (free) a try. 4. Web / Cloud sources: Any documents from these sources will go into one to two buckets: DTPO inbox or Papers (scientific manuscripts). Even clipping of web pages and RSS get be imported in DTPO making it an obvious containers for any and all project related materials. 5. E-mail: This is now my most common source of digital documents I received. It is quite likely that you are in the same situation as I am. With modern mail application (I use Apple Mail), you can have as many “Inbox” as you like. I usually collapse all of them to get a general overview of all my incoming e-mail. I easily receive 80 to 100 “good” e-mails per working day, less on weekend. E-mail are important but can also be disruptive from a getting work done perspective. This is one of the nice thing I rediscovered with the iPad, doing one thing at a time with your full attention, without being side track by all of these other applications requiring your attention all time. TIPs: remove any incoming warning sounds or (Growl) notification. If fact, this should be applied to all incoming information (Facebook, twitter, …) as it is unproductive noise. Look at your e-mail only a few times a day (morning, before or after lunch, end if the day, …) and never look at your e-mail if you do not have the time or energy to deal with what your are going to find. Lastly, you should never have to deal with a given e-mail in your inbox multiple times. A- For any input, if it can be deal with in less than two minutes, you should do it and either trash / recycle that input or keep for future use if needed. Bb- or delegate the action to someone else. In either of the last two above situations, an entry in your task manager should be made. In all instances, nothing (and this includes e-mail) should ever go back in your Inbox (physical, electronic or e-mail). I usually get my e-mail Inbox to “zero” once a day. If you want to learn more about getting your e-mail inbox to zero, have a look at the Inbox Zero series by Merlin Mann. I will tackle the set-up and workflow that I came to in the next post but I want to conclude this one with a sense of how the various software fits with the above decision process in relation to the various inboxes and source of documents. If you know the GTD book, the figure below will seems familiar. If not, I have taken this workflow from David Allen GTD book and I have superimposing on it the software (using their icons) described in part II and part III [copyrights notice: this composition is made solely for educational purposes. 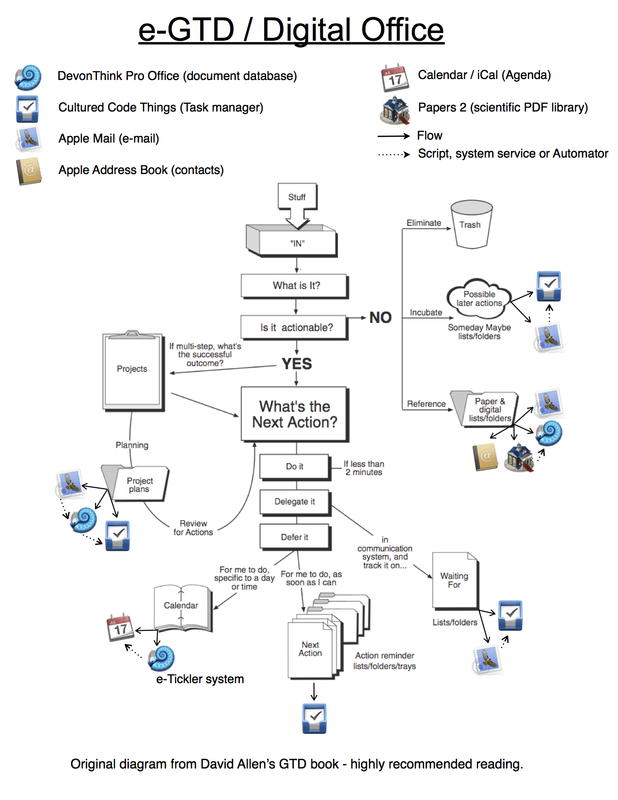 The workflow diagram below is from David Allen’s book and the icons belong to their respective software creators]. The decision tree described before (A, B, Ba and Bb) can clearly be seen on this figure. Which application is attached to the various components of this workflow is also given. The full lines given the flow of decision. The dashed lines indicate automated actions (by scripts, system services and Automator elements) between applications. For example, the creation of a task or reminder for a document or an e-mail in Things is done automatically from DTPO or MAIL by script and system services. Even better they are assigned to hot-key combinations, which means all of this is generated in a few seconds for each entry. The other nice things is that a link is pasted automatically in Things note section of the task entry and if click send you back to the source of the task (directly in the originating application!). In the included figure, you can switch Things for your favorite task manager. However, at this time on the Mac I do not think you will be able to reach this level of integration and ability to deal with a large number of projects with applications other than Things and OmniFocus. No, a simple task-only list application won’t cut as it does not scale. Also, if you really want to stick with the Finder and folders/sub-folder structure for your documents (instead of using DevonThink), you might want to check an application called Things Folder that will help you keep a folder structure organize and in-sync with Things. Thanks! I’ve really enjoyed your series and the diagrams were wonderful. I really appreciate the sharing. Thanks for all the great tips! I am wondering how you manage having your Papers library linked to DTPO. Do you work mainly from DTPO and then use Papers just to generate citations (annotate in DTPO) or rather do all the work in Papers leaving DTPO just for indexing/searching? Merci ! I work in Papers but uses the indexing function of DTPO so that my PDF are part of global searching.